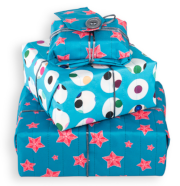 Our wrapologists here at Wrag Wrap headquarters have worked really hard to create a range of beautiful reusable fabric gift wrap that will make your gift look stunning. We hope to fuel a step change in the way that presents are wrapped, rejecting disposable paper, and instead embracing the fabulous idea of reusable fabric. The gift wrap becomes part of the gift. Wrag Wraps are made using fabric rather than paper. Each of the fabric wraps have been designed to overcome the limitations of paper, wrapping a whole range of different shapes and sizes of gift - with no fuss or waste. Each Wrag Wrap is a self-contained wrapping solution with a tie cord and securing button, removing the hassle (and waste) of using scissors and tape. Each wrap comes in a range of sizes to cover almost any gift, with a choice of patterns. There are designs for Christmas and other occasions to cover the rest of your gift wrap calendar. Our latest idea is the Reversible wrap giving you two prints in one, a wrap you can use for both birthday and Christmas. Most importantly, Wrag Wraps are all about your experience. They have been designed to encompass the different approaches to wrapping gifts. Whether you want an easy and fast solution, or perhaps a chance to show off creatively – there’s a wrap for all wrappers, and all occasions. The majority of people love to wrap their gifts and don't want to see an end to this tradition. Many of these people have been searching for a viable alternative to paper. This led us to design the Crackle Wrap.